I've been priming with the Nyx Angel Veil lately and let me tell you, this makes me skin so smooth so I will definetely be making use of it. I'll want a radiant, glowing base so of course my go to foundation will be Nars Sheer Glow. Of all my foundations I just love how this looks the most, I always feel my skin looks amazing when I wear this. I'll set it with the Ben Nye Loose Powder in Fair as it gives the nicest finish. Of course I am then going to apply a tonne of highlight because its totally acceptable at Christmas. It'll be a tough decision between Becca Champagne Pop and the Sleek Solstice Palette as both are so intense and pretty. 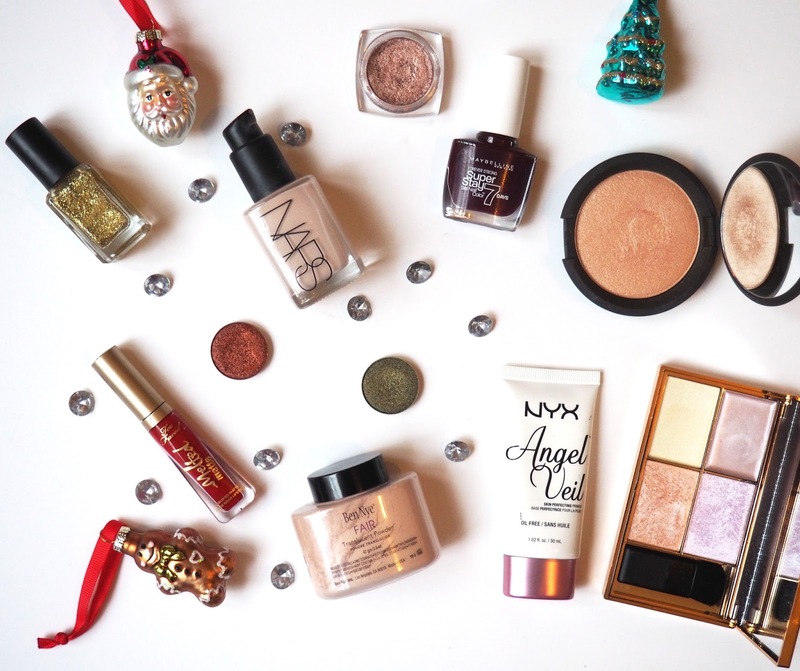 For me Christmas eye make up is all about the sparkle so pressed pigments are the perfect option. I'll work a matte brown shade into the crease to create a bit of definition and then go in with a flat brush on the eyelid. My favourite shades for this look lately have been the Loreal Infallible Pressed Pigment in Amber Rush and the Make Up Geek Foiled Shadows in Flame Thrower and Jester so it's likely I'll go for one of those! For lips there is nothing more festive than a bold letterbox red and the Too Faced Melted Matte Lipstick in Lady Balls is just that. I got this mini version in a Too Faced Christmas gift set and tried it out for the first time recently. I was so impressed with this formula of liquid lipstick, it was light weight, didn't dry my lips and stayed put really well making it perfect for a day of eating and drinking. Finally, I can't forget my nails and I like to go all out with the glitter. This year I have been applying a colour as a base such as the Maybelline Super Stay Polish in Midnight Red and then applying a glitter from the tip to about half way down so it looks like my nails have been dipped in glitter. This look is really simple to create as you don't need to be too precise. My glitter polish of choice has been the Barry M Gold Glitter but any glitter will do the trick.